Remember when Universal and Jon Favreau made it their mission to educate Americans on the “deadly seriousness” of Cowboys And Aliens, despite its boasting a now-formulaic mash-up premise and the title Cowboys And Aliens? That bid for respectability has now reached its logical conclusion as a promotional NASCAR stunt that will see Daniel Craig’s grim visage and laser-bracelet sprawled across the hood of a Chevy Impala, where they will both be spirited around and around the Charlotte Motor Speedway (and other racetracks to come) beginning May 28, each circuit another opportunity to convey the film’s gravity. Even better, you can get your own face on there by visiting the official Cowboys And Aliens website, where you can submit a photo to be included in a special mosaic version of the car that will see debut at the Subway Jalapeño 250—and again, this is all very serious, and not silly. 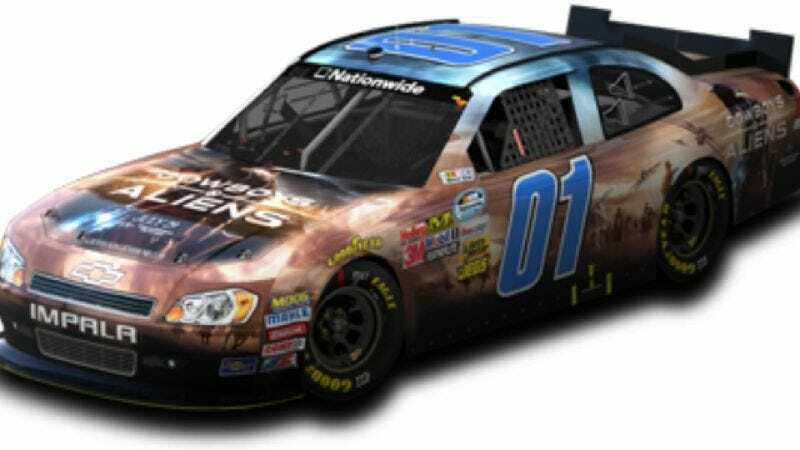 Anyway, all of this means Cowboys And Aliens is the first-ever movie to become a multi-race NASCAR sponsor, which makes you wonder why the producers of Cars 2 didn’t get on this.